I have found that most of my healing and insight was gained while under care of hand therapists. Doctors just examined my hands and gave a diagnosis and a prescription for hand therapy. The treatment part fell on the therapists. California Pacific’s Hand Therapy in the San Francisco Area has helped me heal, and I can recommend them 100%. They will help you understand your condition and provide a path to healing. They helped with exercises, therapy, ergonomics, splints, and work tips. On the San Francisco Peninsula, try Ergohand. Look for a Certified Hand Therapist or CHT in your area for experts in dealing with carpal tunnel syndrome or RSI. Physiologists also helped me heal from thoracic outlet syndrome. After I addressed my hands, a physical therapist helped me understand that my problems were coming from poor posture. They helped set up some exercises and stretches, and prescribed some body work. From hand therapists, you will learn about Hot and Cold Transition Baths, Paraffin Wax Therapy, Icing, and Ergonomics. Keeping a Log Book is a helpful step to take. Massage and Vacations come into play. Do not delay contacting a hand therapist, the sooner you do it, the faster you will heal. Do you notice that you wake up in the middle of the night more often? That maybe a symptom of an RSI or repetitive strain injury. I was literally sleeping on top of a pillow with my hand right underneath, causing my injury to flare at night. Sleeping on my back helped, but maintaining this position all night is hard. 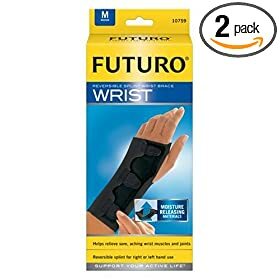 The Futuro Reversible Splint Wrist Brace is a low cost ergonomic splint that can help you at night. I used this splint for a while until I received a custom designed splint from my hand therapy center. Pascarelli’s Book has a good chapter on when and how to do strengthening exercises to combat RSI or Carpal Tunnel Syndrome by using weights. He does not talk about size of weights to use when weight training. When I started his program, I started with very light 1lb dumbbell weights and slowly moved up increments after many months of therapy. I have been doing these weight training exercises every morning for years. As usual, consult your doctor and hand therapist for advice on weight training.